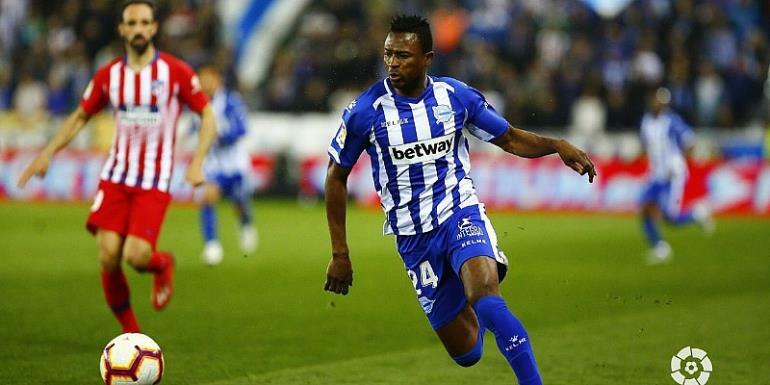 Ghanaian forward, Patrick Twumasi is eyeing more playing at Deportivo Alaves after coming on against Atletico Madrid last weekend. The 25-year-old has endured a difficult time since joining the Spanish Club from Kazakh Champions Astana. Deportivo Alaves were caught-up with the player’s outstanding performance at Astana signing him during the summer transfer. Twumasi’s time with the La Liga outfit has been challenging, barely featuring for the side. Twumasi made his fourth League appearance for club when he came off the bench in their 4-0 defeat to Thomas Partey's Atletico Madrid over the weekend, a game he gave a good account of himself. The attacker is aiming to grab a regular spot in the team having made an appearance for the first time after two months. Coach Abelardo Fernández could make the Alaves squad for the trip to Sevilla on Thursday.